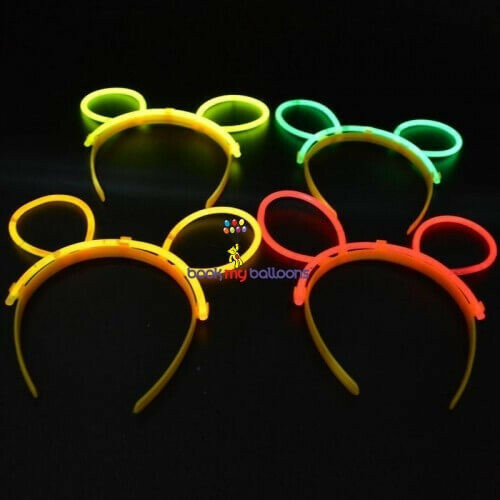 Our glow headbands are one of our most versatile products.Use them as costume accessories, party favors, stocking stuffers, and whatever else you can think of! Dimensions: 8 inches in width (at widest point), 7 inches in length (from top to bottom). Your glow headband will glow 1 time, for 6-8 hours. Each package contains 3 glow sticks, 3 connectors, and 1 headband piece. Assembly and activation is easy with 2 simple steps: First, snap and shake the glow sticks. Second, using the connectors, attach the glow sticks to the headband piece. Assorted colors (green, pink, and blue) of 6 headbands sold per pack (individually packed).